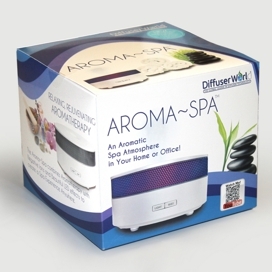 The Aroma-Spa VaporizerTM features a calming, subdued, rotating, and multi-colored LED lighting feature. With the touch of a button your Aroma-Spa Vaporizer™ emits a beautiful ring of color to enhance your tranquil Spa experience. Simply add water and your favorite pure essential oil and the ultrasonic element produces consistent and fragrant vapor. Features include: Continuous mist for 3 hours, intermittent mist for 6 hours, and a color-changing mode. You are able to use the Diffuser as just a light, just a mist, or both. Includes a 6 month manufacturer warranty.